In stock -This product will ship today if ordered within the next 10 hours and 58 minutes. 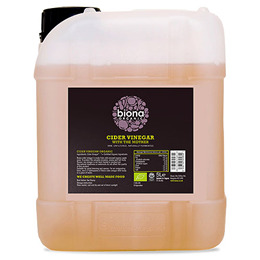 Below are reviews of Biona Organic Cider Vinegar - With the Mother - 5 Litres by bodykind customers. If you have tried this product we'd love to hear what you think so please leave a review. I have been buying the 5 l bottle because I use Cider Vinegar quite often for indigestion but the last one was a bit of a hassle to open because TV the thread on the cap was damaged and also I had to decant it into the previous bottle in order to pour it. I do think that a glass bottle would be better but that would be hazardous for 5 litres. 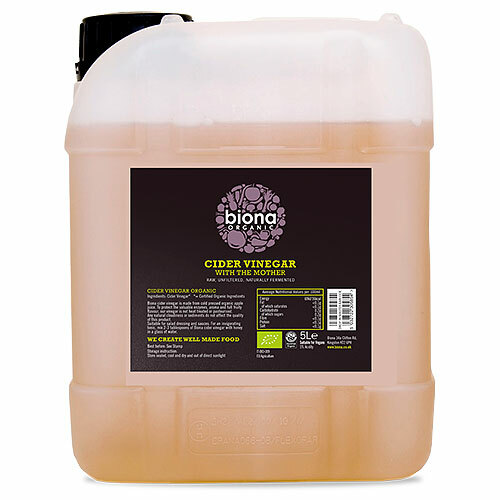 This 'Biona Organic Cider Vinegar - With the Mother - 5 Litres' is excellent! The only reason it doesn't get 5 stars is it's in a plastic container and I'm trying like most of us to avoid buying products in plastic both for the sake of the environment but also due to concerns about direct potential health issues from possible chemical leakage from various plastics including so called 'safe' BPA free plastic! Will be remembering to buy this product in future in the smaller 1 litre glass bottles, a little bit more expensive to buy this way but for me, worth it. Cider vinegar is unparalleled for digestive problems amongst so many other health matters. Couldn't live without it! Certainly it has Mother, good strong smell. But I cannot compare this with Bragg. So, I settle with Biona, it is ok for me. Thank you. It is my thought that it will be good if your container is made from glass rather than plastic because of being vinegar in a plastic container!!!!! !